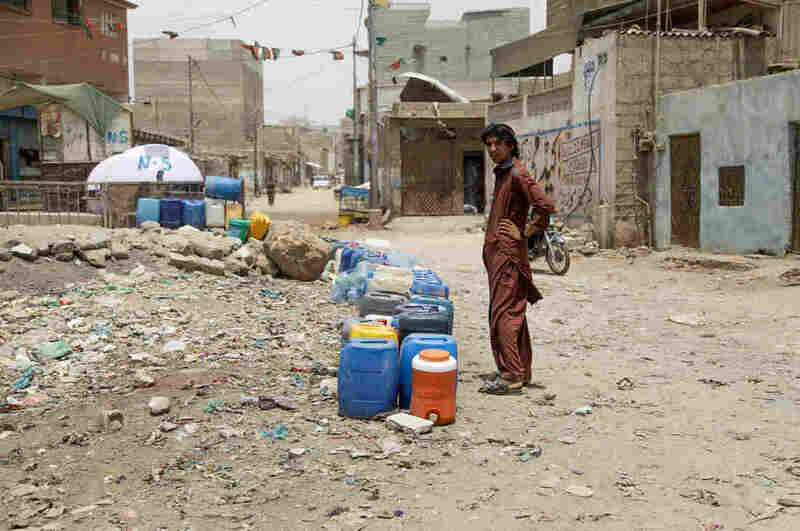 For Karachi's Water Mafia, Stolen H2O Is A 'Lucrative Business' : Goats and Soda In Pakistan's port city, gangs siphon off water from government pipes and resell it to residents. Surprisingly, the municipal water board is now partnering with the mafia to distribute it. Residents have to call men like Mohammad Zubair, a driver who belongs to a group of water handlers known as the "water tanker mafia." For a price, drivers will deliver clean water, which is pricey, or polluted water, which is cheaper. 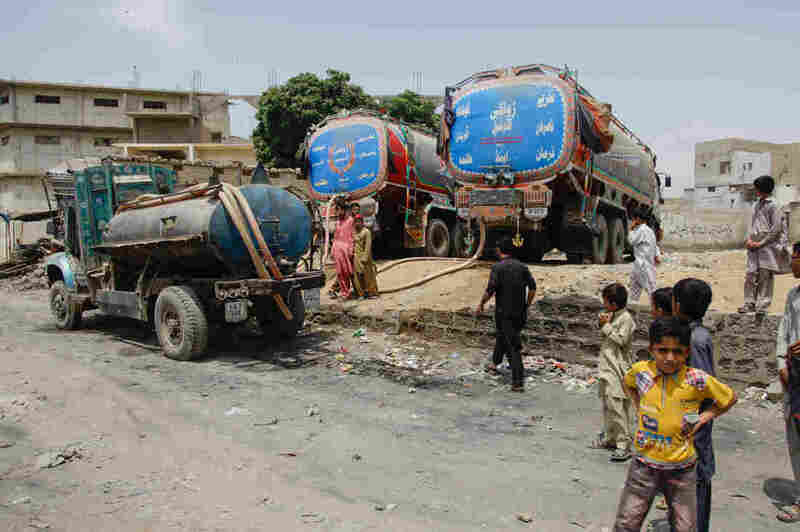 Zubair's tankers can't reach into the narrow alleyways deep in Karachi's slums. So residents order water by donkey cart or motorcycle, or they pay to fill up their plastic jerrycans at "water stations" — large drums of water set up alongside little grocery shops. 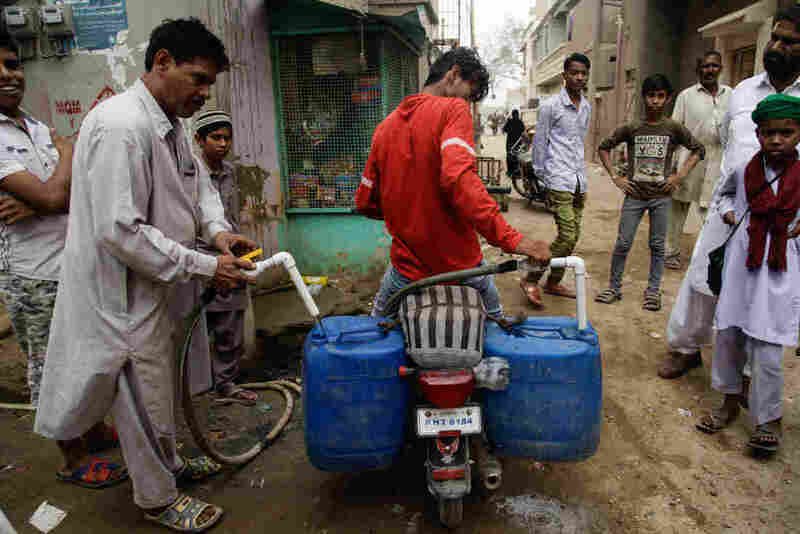 A young man fills the jerrycans tied to his motorbike with water in the Korangi slum. Fetching water at these stations is a duty that has to be done several times a day — so it's often left to children like Shabina. She shrugs when asked about her age, but says she's in preschool. She fills her two jerrycans, about 10 gallons in all. They are placed in a wheelbarrow and her playmates help her push it home. A little girl fills two jerrycans with water in the Korangi slum in Karachi. Fetching water is a duty that often falls on very young children. The situation wasn't always like this. Residents like Raja Akhtar say that years ago, they used to have running water. But about a decade ago, residents say the mafias began siphoning off water from government pipes running through private land — and their supply dried up. The reason for water tapping is obvious. "It's a lucrative business," says Sanaa Baxamoosa, general manager at Hisaar Foundation, a Karachi-based nonprofit that works on water, food and job security. The mafia sells it at different prices based on the water's quality. The government's water is considered the cleanest, so it fetches the highest price, about $150 for a month's supply. Akhtar can't afford that — it's more than his monthly salary as a security guard. So he buys cheaper brackish water from a different supplier. 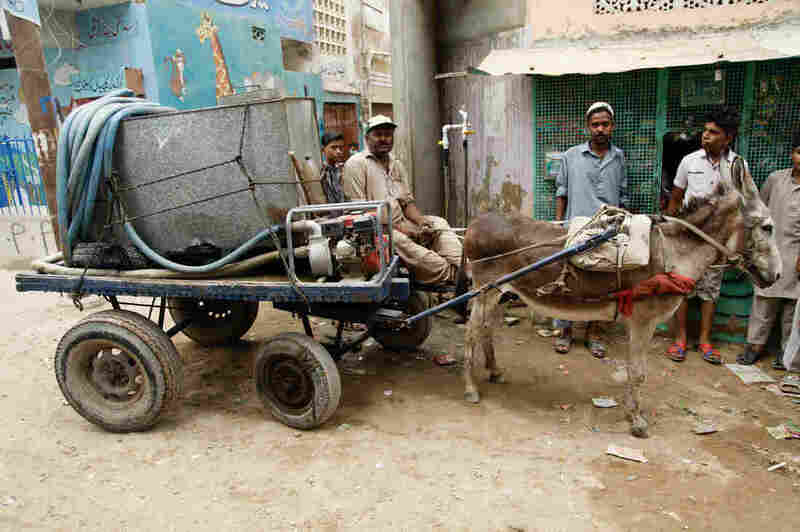 Men like Zubair specialize in selling polluted water to Karachi's poorest residents. This water often comes from wells dug near a dam on the outskirts of Karachi. Residents say if they don't boil it immediately, it starts to stink. It also costs Akhtar about $20 a month. The business largely exists because Karachi's water supply barely covers half of the city's needs. According to Ghulam Qadir, the chief engineer of the Karachi Water and Sewerage Board, the city receives 450 million gallons a day from the Indus River and a nearby dam — but requires 1,200 million gallons. "We are suffering from water scarcity, and that's why the tanker mafia is active," says Qadir. He estimates that about a third of the municipal water supply is lost or siphoned off. The situation in Karachi reflects a broader water crisis across Pakistan. Inefficient agriculture, dwindling aquifers, an increasingly dry environment, rapid demographic growth and heavy pollution are diminishing both the quantity and quality of water for residents. And this means that Karachi's water problems, and its attendant crime of water theft, may become a problem in other parts of Pakistan. In a grubby café in Karachi, Saghir Ahmed, a water tanker driver, explains how the mafias work. 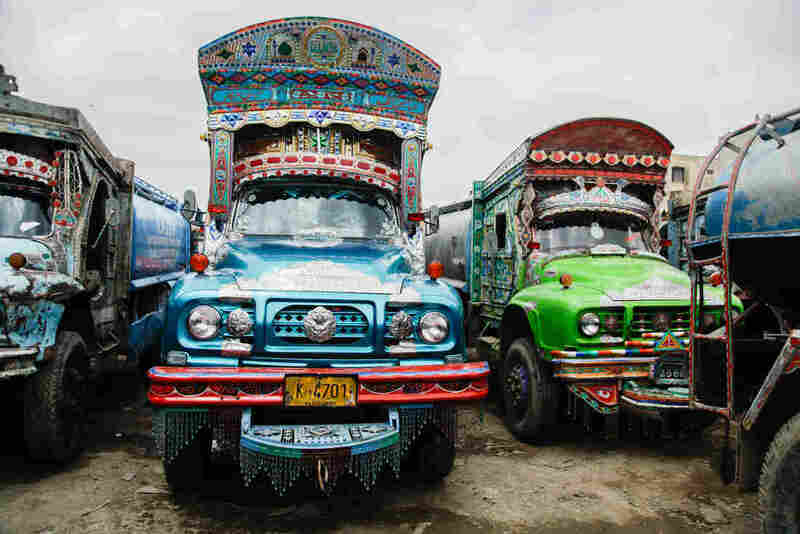 He says that he and other drivers routinely pay off officials from Karachi's water board, the police and the "landlords" — men who own the land where the government pipes are punctured, and who build valves to allow the drivers to pump the water. Those valves, used to steal government water, are called "illegal hydrants." "The water board, police and landlord — these three — they benefit, they take the money," he says. Karachi's water crisis got so bad that about a year ago a judicial commission was formed to investigate it. Soon thereafter, the water board shut down many of the illegal hydrants. Qadir, the chief engineer at the Karachi water board, said they also lodged more than 300 complaints with the police against suspected water thieves. It's unclear, however, how many illegal hydrants remain. And then, says Baxamoosa, the activist, the Karachi water board tried to entice the mafias to work legally. "They've kind of partnered with them. They're using these tankers now as their distributors," she says. Two water officials spoke to us on condition of anonymity — they were not allowed to speak to media — and confirmed this. They said tanker mafia drivers could fill up from legitimate government water sources, but on one condition: They would have to distribute about half the water at cheaper, government rates to residents in designated areas where there are no pipes, or where the water infrastructure has collapsed. They are free to sell the rest at commercial rates to whomever they wanted. Basically, the tanker drivers now sell nearly half of the city's supply of water. Despite those reforms, Karachi's water problem isn't solved. 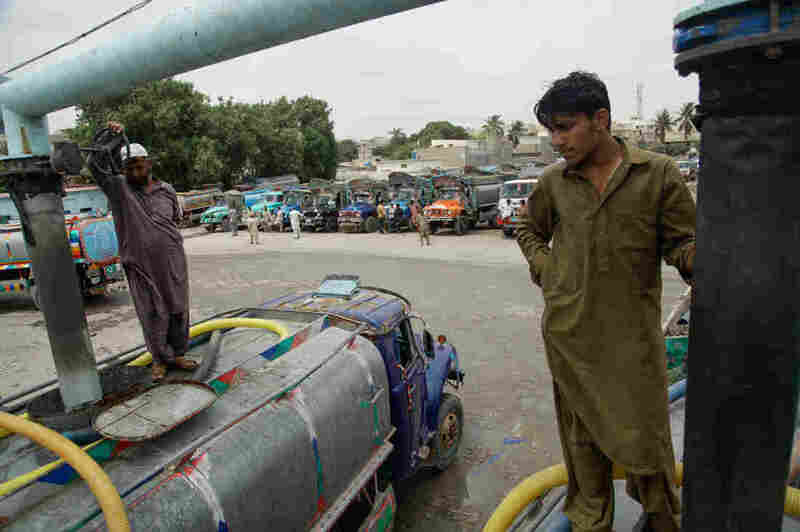 Because the water tanker drivers can sell about half of the government water at commercial rates, it's still unaffordable for many of Karachi's residents. And the taps that run into the slums? They are still dry, likely as a result of ongoing drought and infrastructure damage, says Qadir. So residents like the Akhtars must buy water from the local water stations that dot the slum. At the Akhtar household, Raja's wife, Imtiyaz, showed us where she boiled their water, hoping that would kill whatever made the water so smelly. Then she made everybody tea. She gestures to her neighbor, Shabana Khalid, 28, who dropped in for a visit. Her son constantly has diarrhea, one of the leading causes of child mortality in Pakistan, according to UNICEF. 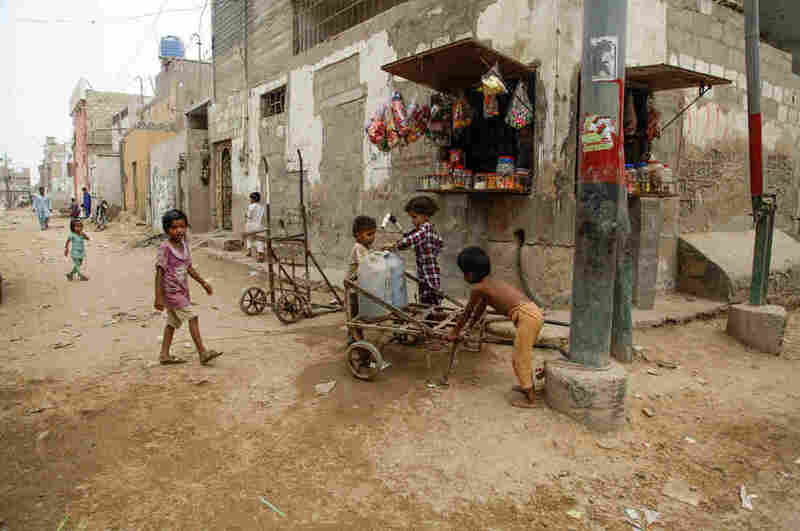 The cause of much of Pakistan's diarrhea: bacteria in the polluted water that residents drink. Akhtar says she has terrible stomach pain. She and her husband aren't sure if it's the dirty water they buy because they can't afford so-called "clean" water. Whatever the cause, she can't afford decent medical care because their spare money is spent on water. Her husband says it's a vicious cycle that will only be broken once they have piped water. "Our lives would be much easier," he says. "We would no longer face this problem." Junaid Ahmed, freelance reporter in Karachi, contributed to this story.